The Doubler Stones, looking to the south. These two naturally shaped rocks stand on the western edge of Rombalds Moor above Silsden. 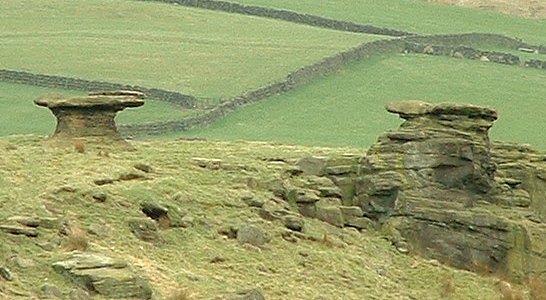 Their strange shape is due to the fact that the top part of the rock stack is a hard gritstone whilst the lower part is an easily eroded sandstone. The top surface of both rocks have cups, the eastern one has 2 cups while the western stone has several cups along with grooves and deep basins.